Brenda and her 4 siblings are 10 weeks old. We were told they are boxer/lab mix but I think maybe some sheltie or golden retriever by the looks of the long hair on some of their ears and coats. They were a little shy at first but are coming around quickly to trust us. They are not hyper pups and don't jump all over you. They will only be placed in homes where someone is there most of the day so they can be properly housetrained. There are 3 males and 2 females. 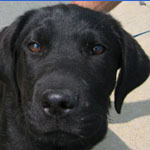 Licorice is a female black lab mix who is a typical playful pup. She is so much fun but should go to puppy school. She is 4 months old and 35 pounds. She's a short and stocky lab who plays well with bigger dogs. She plays with a rottie all day long..she was picked up by the dog catcher and would have been killed if the rescue did not rescue her. She's from WV. 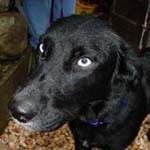 Kya is a sweet and gentle female lab who just weaned a little of puppies. She is a good mom to her pups and will be a lovely companion for a family who promises to love her. She is such a gentle dog to the little ones, she even let the other terrier pups try to nurse along with her pups, even though she has long dried up. 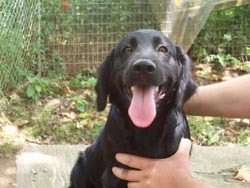 On the other hand, she is still a young dog herself and can play and play with Bella, the other lab. Her pictures don't do her justice as she is such a gorgeous dog. Now that her babies are gone, she needs a home to call her own, where she can be the baby! 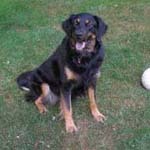 Meet Maddie, a happy, 80 lb, four year old female Rottie/Border Collie/Shepherd mix. 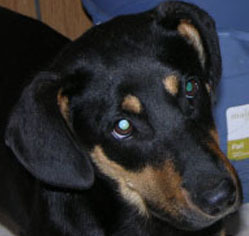 Maddie is extremely smart, and is second level obedience trained. She knows sit, down, heel, stay, and walks great on a leash. Maddie has perfect manners; she is totally house trained, has never counter surfed, never gotten into the trash, or chewed anything and she does not go on the furniture. She is well behaved and quiet in the house. She is crate trained, but has no problem staying home for the day outside the crate while everyone if off at work or school. Sarah and her sister Emmy, were found by the side of a rural WV road. They were brought to a shelter and put into a foster home. They're 8 weeks old and appear to be terrier mixes. 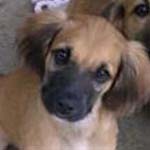 We will place them separately as each deserve loving homes where they can receive individual attention and training. They are too delicate for small children, so please no children 10 and under. Also, please be someone who works from home or is away no more than 2-3 hours tops for the whole day as puppies need socialization. Willy went home, but Tyson is still available as of 9/7/06. Tyson and Willy are two of Kya's male pups. These pups will be adopted separately. They were in a foster home in PA and arrived on 9/2 and available after 9/5. Mama dog, Kya, is a blue-eyed retriever and father is a St. Bernard/Golden Retriever mix. They look more like Dad. They were all brought to a shelter along with mama, Kya, and have been in the loving care of a foster home who pratices holistic care ever since. All recently received a chiropractic adjustment, which large breed pups should have to ensure play without injury. They will be 8 weeks on 9/1. Four are black/white and one is tan (female) and there are males and females in the litter. Adopters who use holistic care are given first preference. 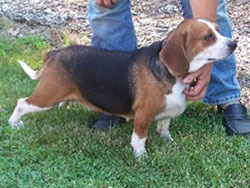 Spice is a 3 year old soon-to-be-spayed female beagle who was a field trial competitor. She is medium size, travels well, been competed, had a litter, all shots, good with kids, needs some work on house training as she lived in a kennel. She is crate trained and will need help with the transition to house training. These three gorgeous Shephad/lab pups came into a rescue in WV with their mama. They are easy going and have been exposed to kids, cats, and dogs. A fenced in yard is required for families with children. They will be available after 9/5/06. There are two females and one male. Rosy is a lovely six year old female Border Collie mix who was picked up as a stray and slated for euthanasia in a rural dog pound. 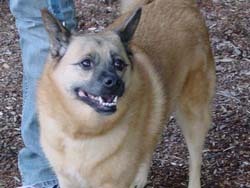 She wears a constant smile and is great with kids and other dogs and cats. 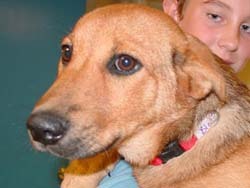 She is being fostered with a volunteer in Pennsylvania and will be available for adoption in the near future. Becky is the last puppy left in this litter of 5 -- and just as adorable as the rest! We were told they are boxer/golden mix but she looks more yellow lab. She is a little shy at first but comes around and is very affectionate. The litter are not hyper pups and don't jump all over you. 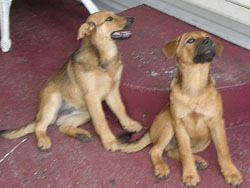 They are crate trained and extremely well behaved and played nicely together. 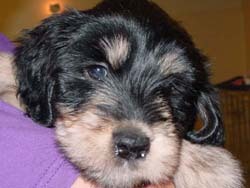 They will only be placed in homes where someone is there most of the day so they can be properly socialized. Please see our "How to Adopt" Page for adoption requirements and other important information including the adoption process. These three gorgeous Shephad/lab pups came into a rescue in WV with their mama. They are easy going and have been exposed to kids, cats, and dogs. A fenced in yard is required for families with children. They will be available after 9/5/06. There are two males and one female. Please read our "How to Adopt" Page re: puppy adoption requirements and other important information. If you are interested, you can find the application link on this page also. 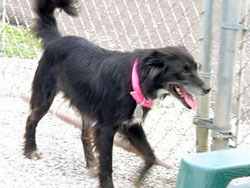 Cici went home on 9/6/06 but Suzi is still available. They were in a foster home in PA and arrived on 9/2 and available after 9/5. Mama dog, Kya, is a blue-eyed retriever and father is a St. Bernard/Golden Retriever mix. They look more like Dad. They were all brought to a shelter along with mama, Kya, and have been in the loving care of a foster home who pratices holistic care ever since. All recently received a chiropractic adjustment, which large breed pups should have to ensure play without injury. They will be 8 weeks on 9/1. Four are black/white and one is tan (female) and there are males and females in the litter. Adopters who use holistic care are given first preference. Emmy and her sister Sarah, were found by the side of a rural WV road. They were brought to a shelter and put into a foster home. They're 8 weeks old and appear to be terrier mixes. 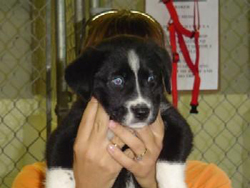 We will place them separately as each deserve loving homes where they can receive individual attention and training. They are too delicate for small children, so please no children 10 and under. Also, please be someone who works from home or is away no more than 2-3 hours tops for the whole day as puppies need socialization. Emmy went home 9/6/06 but her sister, Sarah, is available as of 9/6/06. 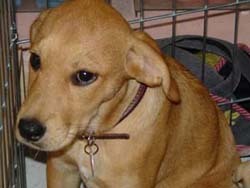 These pups belong to Kya, the female lab listed on our Web site. They are in a foster home in PA and will be arriving on 9/2 and available after 9/5. They are lab/collie mixes. 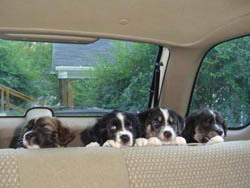 They were all brought to a shelter along with mama, Kya, and have been in the loving care of a foster hom ever since. They will be 8 weeks on 9/1. Four are black/white and one is tan (female) and there are males and females in the litter. The father is a St. Bernard/Golden Retriever mix. 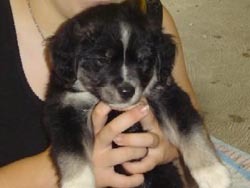 Maggie is approximately 5 months old and is a Collie mix. She weighs around 35 pounds. She's been with other dogs, cats and is a very sweet petite love bug. She was a stray that showed up at a family's house along with Max who was adopted last month. they were seen with a bluemerle collie that may have been a parent for Max who was a Merle and they both have those long collie noses. This family didn't want to keep them any longer once they started to get big. She was spayed and had complications after her spay surgery so was kept behind, but is all healed now and will be available after 9/5/06. These 5 siblings are 10 weeks old. We were told they are boxer/lab mix but I think maybe some sheltie or golden retriever by the looks of the long hair on some of their ears and coats. They were a little shy at first but are coming around quickly to trust us. They are not hyper pups and don't jump all over you. They will only be placed in homes where someone is there most of the day so they can be properly housetrained. There are 3 males and 2 females. Bella is a playful 9 month old, 45 lb. 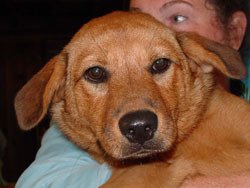 female spayed Lab mix who was rescued from WV. 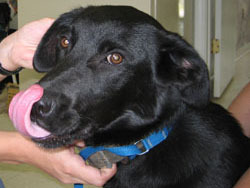 She loves to play with other dogs and is tireless in her play, but very friendly and sweet. She would be a great family dog and would be an easy dog for a family with older kids. She might be to rough with a family that had cats. She's already spayed and seems house trained. Here's an update from her foster mom: Bella is doing very good. She is kinda of on a schedule for peeing and pooping outside, but she still has an accident here and there if she drinks too much water at one time. But her and Bruschi are getting along well. She is doing better with off and sit. She loves to play ball and a frozen Kong filled with peanut butter is her favorite thing. She goes nuts and it keeps her busy for a little while. I took her running yesterday and she did so good. Stayed by my side the whole time. She is starting to relax a little bit and lay down when we are just sitting or cooking, but she still need to by our side where ever we go. She is so sweet and lovey. My neighbors think she is the best. She still doesn't know what to think about the cats, but all she does is sniff, lick and follow them so far, which they aren't very fond of but they just walk away. Cricket is a seven month old Lab mix. 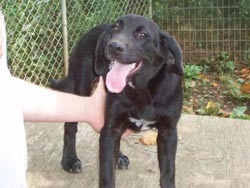 She weighs under 40 lbs and is a medium-sized lab mixed with some hound, probably a beagle as she's smallish. She loves to play and is a good girl. Jensen is a six year old male English Pointer who sadly lost his home when his owner died suddenly. 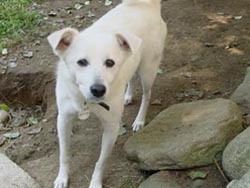 He came in with Tara, the ten year old female spitz mix and they are in a foster home together and doing very well. It would be great to place them together, but we are open to placing them separate as they do well on their own. Jensen is still quite playful but also loves sitting and watching TV with the grandson of the foster mom. Both dogs are good with kids, but were not raised with them. 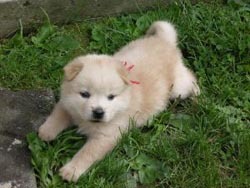 We have three 8 week old fuzzy pups who have black tongues like a chow but appear to be mixed with Spitz or American Eskimo or Samoyed. They are playful and very sweet. They are already crate trained too. They were abandoned at one week old and bottle fed by their foster mom. They are now ready for their own homes. the females are adopted, but Kip the male is available. He's a big fluff ball and extremely laid back so will probably be a larger dog. He looks like a Samoyed. 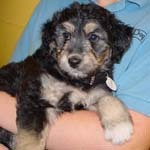 Please read our puppy adoption requirements and other info on our "How to Adopt" page. 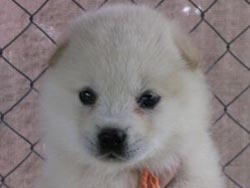 We had three 8 week old fuzzy pups who are golden blonde but have some black on their tongues like a chow The females got adopted, but we held the male, Kip, for someone who ended up wanting a smaller dog, so he is the only pup left. He is handling it well and plays with Snowball, the spitz. He crates well and is very quiet, but let him out and he is a playing machine. He loves the rough and tumble wrestling and pulling on your pant legs, but when you pick him up, he is just like a big stuffed teddy bear. He lies quietly and licks your face. He still has the puppy breath and is just a LOVE. He will get scooped up quickly, we think. Please have flexible working hours or be a stay at home with older kids (ten and up if possible as he will get big quickly). 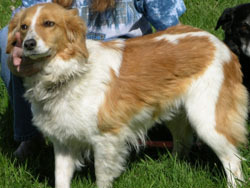 Lady is an English Shepherd-type red & white spayed female dog, approximately 5 years old. She appeared as a stray at a local home and had 11 healthy puppies, all of which were adopted. The homeowners fostered her for 8 months and made great strides in overcoming her extreme shyness. They kept her on a chain for a large part of the time because she disappeared into the woods and they had trouble catching her. At that time, she was thought to be approximately 2 years old. She was moved to her current foster home in an attempt to further evaluate her and give her extra attention and training. 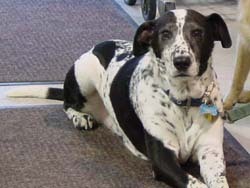 A vet checked her, determined she was older than first thought, and prescribed arthritis med. She seems to have made some improvement, though still sometimes limps on the foreleg (from an old injury) and is very low energy. Lady is an extremely sensitive, submissive dog. She has warmed up to her foster people and comes when you pat your leg. She rolls over on her back and enjoys belly rubs. She seems quite intelligent and loveable. 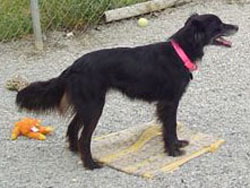 She walks well on lead and plays a bit with other dogs but tires quickly. She is good with dog-friendly cats and with gentle children. She is housebroken. She travelled ok in a crate to the vet and acted quiet but not terrified while there. She rests nearby or on an enclosed porch when the foster mom is working at the desk. She needs to belong to a patient owner who is willing to gain her confidence. Someone who is retired or who wants a dog mainly as an indoor companion seems ideal, as she seems to get along well on 3-4 short walks a day. Her beautiful long coat will need regular brushing, but she's basically a low maintenance pet. Lady is doing so well in her foster home, that she is considering adopting her so as to not move her again. 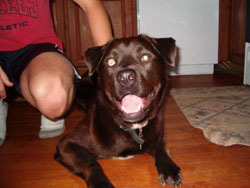 Logan is a one year old Chocolate lab/Rottweiler mix. He has one brown eye and one blue eye so he could have some husky in him too. 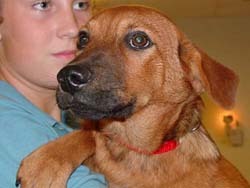 He was picked up as a stray and did his ten days at the pound. 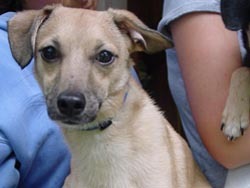 He is being fostered and is good with the other dogs in the house hold and is a good-natured dog. He needs some leash training and general obedience training. He is neutered and up to date on vaccines. He is in a foster home in Natick and available to be seen by private appointment. Lucas is a 15 lb. 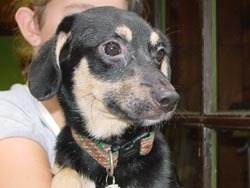 neutered male Dachshund/Sheltie mix. He's adorable and playful and very curious about everything. His only drawback is he's a little timid with men. He was just not socialized with men so an adopter needs to be willing to work on that. He's a young dog and will easily adjust with a little training. Lucas and Rugby are siblings that have been raised together. Their owner has been hospitalized and can no longer keep them. Their Mom was a sheltie mix with long hair but the boys didn't inherit their Mom's long hair. They are 8 months old and have been raised with kids, dogs and cats and are good with all, except Lucas can play a little too rough with the kitties. They are neutered and housetrained. They each weigh 20 lbs and will be placed separately. 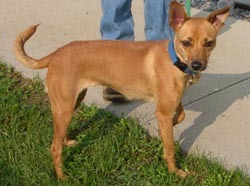 Pip is a young female Min Pin mix, probably with chihuahua. 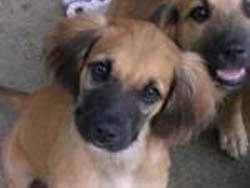 She a loveable little dog who loves to play, play, play. She loves toys, especially squeakies. She's very affectionate, is a barrel of laughs and like many small dogs, she can be fresh with large dogs. She weighs about 15 lbs. 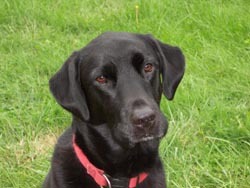 Reilly is a five year old male lab cross. He has a beautiful lab face with a funny curly tail; it curls up like a pig's tail. He is neutered, house trained, and knows basic commands. Reilly is your typical happy go-lucky labby boy. Although on the small size, about 55 lbs, he is very strong and should go to a home with no children or older children who can handle his strength. He is good with cats, kids and some other dogs. He is currently in a house with another large male dog, two cats and two small children on an electric fence. Reilly can be dominant with some other dogs and strangers and territorial around the fence. He is very treat-motivated and is a fast learner so someone with the time to give him the one on one around the fence would be awesome. He needs a dog-experienced home who is willing to spend the time with him. He is a great dog who loves the water, loves to play and do everything dogs do. He is good in the house and past the chewing stage so would be great for a working person. Rugby is an adorable dog who came in with his brother, Lucas. He is friendly and gentle and playful. Read his story as follows: Lucas and Rugby are siblings that have been raised together. Their owner has been hospitalized and can no longer keep them. Their Mom was a sheltie mix with long hair but the boys didn't inherit their Mom's long hair. They are 8 months old and have been raised with kids, dogs and cats and are good with all, except Lucas can play a little too rough with the kitties. They are neutered and housetrained. They each weigh 20 lbs and will be placed separately. Arriving 9/2, available after 9/5. Snowball is a delightful 3 year old tiny female Spitz mix. She weighs less than 20 lbs and is a playful dog once she comes out of her shell. She is shy at first, but when she warms up, she is all play bows and runs around the yard enjoying life. She loves stuffed animals and soft toys and it is so cute to watch her play with them. She is good with small dogs and plays with the puppies very gently. She would be too delicate for children and probably would be shy with men, so a female adopter would be perfect. she's warming up to men too, though. Her pictures don't do her justice. Tara is an adorable, friendly, playful 10 year old spitz mix who sadly lost her home when her owner died suddenly. She came in with Jensen, the six year old Pointer and they are in a foster home together and doing very well. It would be great to place them together, but we are open to placing them separate as they do well on their own.